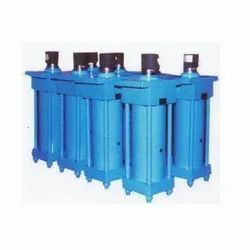 Manufacturer of a wide range of products which include hydraulic cylinder. Owing to profound experience of the industry, we are engaged in offering a wide gamut of Hydraulic Cylinder. These cylinders are manufactured using high grade raw material which we source from reliable vendors of the market. All the cylinders offered by us are widely used in various industries for their high durability. Further, a team of diligent experts makes sure that only high quality material is delivered at clients’ location within the committed time period.